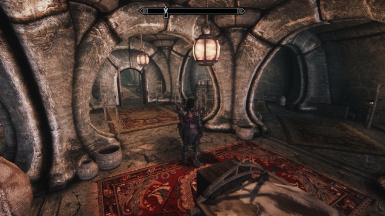 Some fixes and additions to Dragonborn\'s Severin Manor to make it more appealing. Food Crates Are back and working as intended. Had to remove food crates cause they wont stay in place. final version. 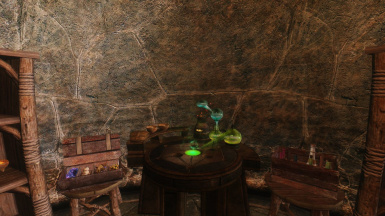 - New: Activatable Wine Rack next to Dunmer Liquor rack to fill up the space on the table. - Re-organized the Enchanting room. - Forgot to edit the navmesh to accommodate the changes I made in the previous version. fixed it. - Cleaned with tes5edit (undeleted ref's). New: An activatable unique Soul Gem Chest in the enchanting room for your soul gem storage. 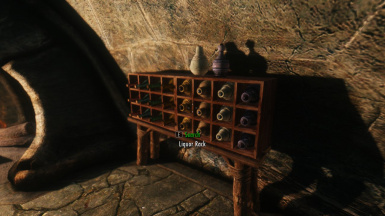 New: An activatable unique Liquor Rack in the main hall using the new Dunmer Liquor Bottles for your Drinks storage. New: 4 activatable unique Food crates with food meshes nicely organized in them: Meat crate, Ash Foods crate, Cheese and Bread crate, and Produce crate. see screenshots. New: Bookshelf in Enchanting room under the Soul Gem Chest. New: 2 new Mannequins and rack sets in front of the main Bed. New: 2 new Mannequins and rack sets in front of the guest Bed. Fix: All shadow striping from lights should now be fixed. 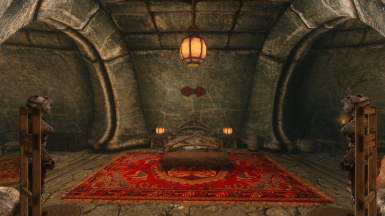 Fix: The bed in the guest room has been assigned to player faction rather than the player, so it would be usable for guests/followers if you use a mod for that. - Vanilla fix: Added activators to Display cases. you can now properly "insert" weapons in them. Not staffs though. 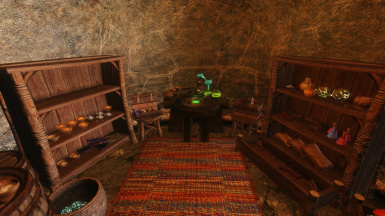 - Added a manniquen and 2 racks to the corridor leading to crafting area. - Added a manniquen and 2 racks to the side bedroom. - Turned 2 static barrels in crafting area to container barrels. - Strong Box in the bedroom above the safe is now a proper container. But with a less unique model. - New Bookcase and chair in main Hall. - Increased light slightly in the tanning rack area. - New idle markers added in house, useful if you have a follower/spouse sandboxing around so they'd do something else rather than chomp on food all day. 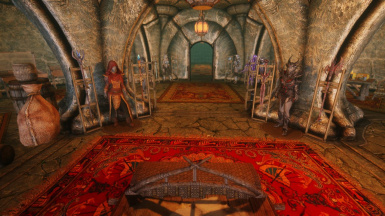 - crafting area safe was incorrectly using the same base as the bedroom safe. turned into a different ID safe. ***remove your items from that safe before upgrading. *** All other containers in the house are upgrade-safe. - The chest infront of main bed is now a nice looking footlocker instead. - Should now be able to move in spouses. - dimmed the lantern over the main bed a little bit. - removed some useless baskets next to bedroom bookcase and put a chair next to the bookcase instead. - Food Crates are Back and working as intended, static containers. - Had to remove food crates due to them moving around. 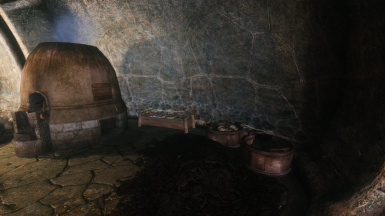 - New: Activatable Wine Rack next to Dunmer Liquor rack. 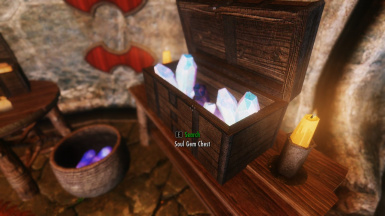 - New: An activatable unique Soul Gem Chest in the enchanting room for your soul gem storage. 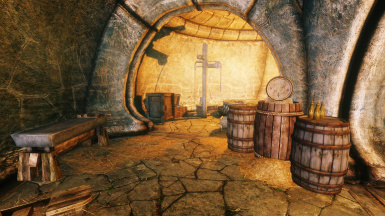 - New: An activatable unique Liquor Rack in the main hall using the new Dunmer Liquor Bottles for your Drinks storage. 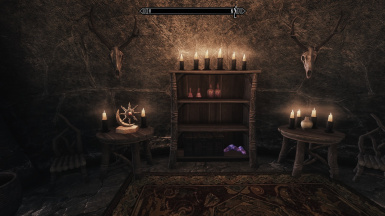 - New: Bookshelf in Enchanting room under the Soul Gem Chest. - New: A Display case in the Enchanting room . - New: 2 new Mannequins and rack sets in front of the main Bed. - New: 2 new Mannequins and rack sets in front of the guest Bed. - Fix: All shadow striping from lights should now be fixed. 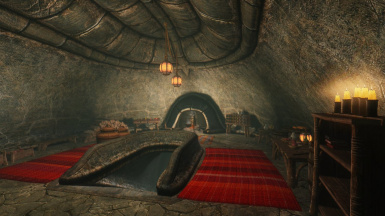 - Fix: The bed in the guest room has been assigned to player faction rather than the player, so it would be usable for guests/followers if you use a mod for that. 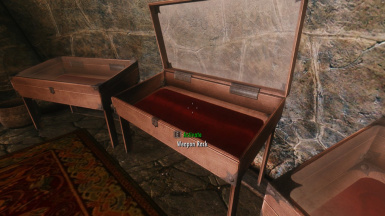 - Vanilla fix: Added real activators to Display cases that Bethesda forgot/ignored. you can now properly "insert" weapons in them. Not staffs though. - The chest in front of main bed is now a nice looking footlocker instead. the original chest is not removed but moved to the left so your stuff is safe. 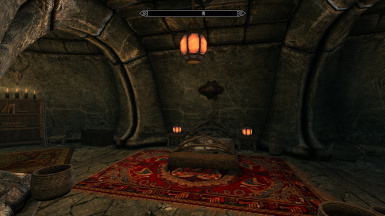 - crafting area safe was incorrectly using the same base as the bedroom safe. turned into a different ID safe. remove your items from that one safe before upgrading. All other containers in the house are upgrade-safe. 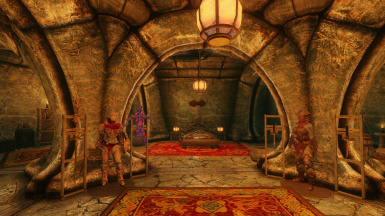 - Added a mannequin and 2 racks to the corridor leading to crafting area. - Added a mannequin and 2 racks to the side bedroom. - Strong Box in the bedroom above the safe is now a proper container. - New idle markers added in house, useful if you have a followersandboxing around so they'd do something else rather than chomp on food all day. 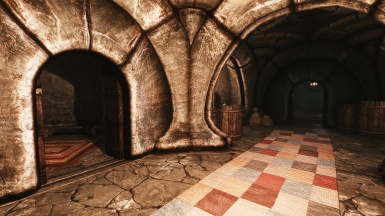 Both Main and lite versions updated with final fixes to flickering lights and Now the Main hall, Main corridor and bedrooms all have shadow-casting lights. 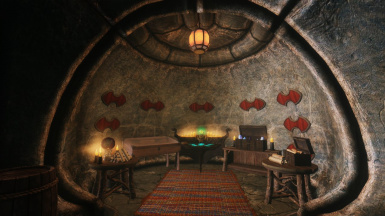 - Fix: The music in the house is no longer dungeon music but main Solstheim music. - Tweak: Dark areas have been relit by additional lanterns. 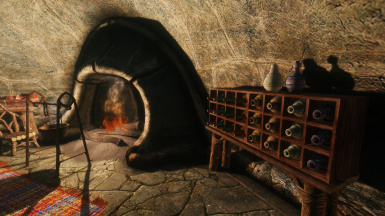 - New: Activatable unique Wine and Liquor Racks in the main hall using the new Dunmer Liquor Bottles for your Drinks storage. 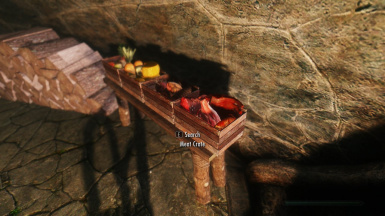 - New: 4 Activatable unique Food crates with food meshes nicely organized in them: Meat crate, Ash Foods crate, Cheese and Bread crate, and Produce crate. see screenshots. - New: Display case in Enchanting Room. 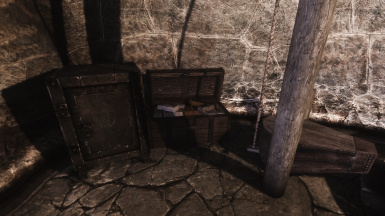 - New: Added Satchels on the alchemy and enchanting tables (lite version), and ingredient/potion crates in New items version. see screenshots. - New: items version has some new decorative items in main bedroom. - New: Added safe and box in crafting area (lite version), and New items version has an ore crate and ingot box. 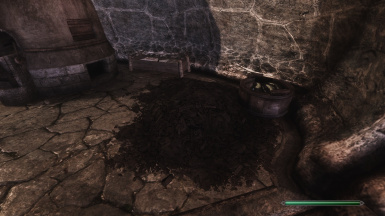 Vanilla fix: Added real activators to Display cases that Bethesda forgot/ignored. you can now properly "insert" weapons in them. Not staffs though. - Tweak: Turned 2 static barrels in crafting area to container barrels. - New: Bookcase and chair in main Hall. - New: mannequin and 2 racks to the corridor leading to crafting area. - New: mannequin and 2 racks to the side bedroom. 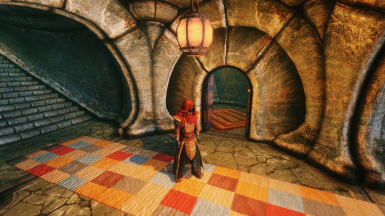 - New: idle markers added in house, useful if you have a follower/spouse sand-boxing around so they'd do something else rather than chomp on food all day. - Tweak: Excessive amounts of hay in the main hall have been removed and replaced by a table and an Ash yam Urn. 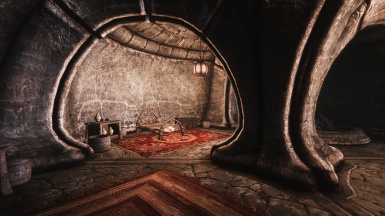 - Tweak: The (IMO) Nordic-themed Animal pelt Rugs have been replaced by regular woven rugs, I recommend using Celtic and braided rugs to get what you see in the screenshots. - Lite version with only vanilla/Dragonborn items. only minor tweaks. Not as up to date as main version. 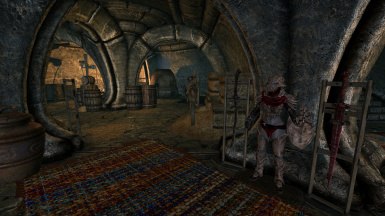 Severin Manor Guard, a nice addition to the house and compatible. Decorator Assistant. must have for anyone who cares about their player homes. Spouses Can Live Everywhere to get your spouse to live there.